On Your Feet!, a musical extravaganza built around the groundbreaking career and inspirational story of Gloria and Emilio Estefan and their hit-making band the Miami Sound Machine, has something going for it very few jukebox-style musicals can claim. The core of the band audiences see playing live on stage is comprised of Estefan's original group from the period when they made their hits. Keyboard player Clay Ostwald, who tours as the show's music director, was hired into the band in 1986 when Estefan was building out her rhythm section. Ostwald had been playing in bands with the Miami Sound Machine's band leader Jorge Casas since the two met in college in 1980. Welcome to the Sound Machine. "The core has been together since then," Ostwald says, describing the reunion for On Your Feet! as "a lot of fun." "Some of the concert scenes are very much like a live concert with Gloria and the band as seen on stage," Ostwald says. "But most of the time, we're behind the backdrop and some of the music has been recrafted to fit the scenes." On Your Feet! tells two main stories. 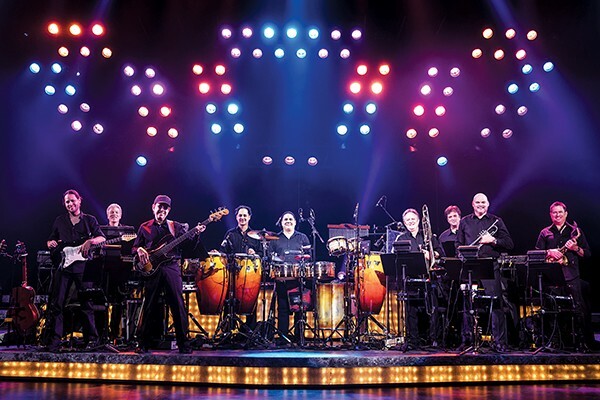 The first act follows Estefan's struggle to maintain her distinct personal and cultural identity as the band placed Latin-influenced hits like "Conga" and "Rhythm Is Gonna Get You" on the charts. Act two follows the singer's astonishing recovery from a catastrophic tour bus accident. On Your Feet! is also, very much an immigrant's story. Audiences will likely leave the theater not only humming the music but hearing the play's defiant reminder, "This is what an American face looks like." "We take that as part of our mission, too," Ostwald says.